Again and again these past two weeks, since unarmed 18-year-old Michael Brown was shot multiple times by police in Ferguson, Missouri, I’ve found myself holding my breath and pressing a hand against my chest, as if the counter pressure could ease the ache. Each night after I get in bed and the clock nears the midnight hour—the time demonstrators in Ferguson are being forced to disperse—I’m glued to Twitter, the only place where it seems any real news about the situation is available. The sleep that follows is as disturbed as my mind, and I wake up before my alarm, both eager and afraid to hear if anything transpired while I was sleeping. Over breakfast, my husband and I trade anecdotes we’ve heard—like the 90-year-old Holocaust survivor who was arrested for “failure to disperse” a protest march in St. Louis, and the black woman, protesting with her teenage son, who was told by a Ferguson cop to “go get a job” (she is, in fact, a financial analyst). At dinner, our teenage daughters and their friends join the conversation. I am, in other words, consumed by what’s happening in Ferguson and by the stark picture it paints of our culture. But I’ve been (mostly) quiet outside of my home. Why? Because I’m a white woman with the full range of white privileges. I’ve seen how so many “well-meaning white people” have been criticized for the ways they’ve tried to join in the outrage and support the conversation, and I don’t want to be one of them. Most of all, I don’t want to be accused of trying to “make it about me.” Because I know it’s not. But at the same time, I believe it has to be about me, and about you, whoever you are—at least to a certain extent. That’s because I believe we have to be personally engaged enough to be sufficiently angry and hurt. Our hearts have to rise to meet our minds—everything we know about the history of racial injustice—if any real change is going to be seen. For me, it gets personal when I think about two of my closest friends here in town—both women are black and raising black sons. It gets personal when I set a plate at our table for my daughter’s boyfriend D, who is 18 and black and started college the same week Michael Brown was supposed to. I wonder if D’s mom has had talks with him about how to respond to police, and while I hope she has, just the thought of it makes my throat clench. A week ago, as tear gas was being used to disperse crowds of protestors in Ferguson (along streets I drove often as a newspaper reporter covering North St. Louis County in the mid-1990s), my daughter and D had a group of friends over for a bonfire in our backyard. 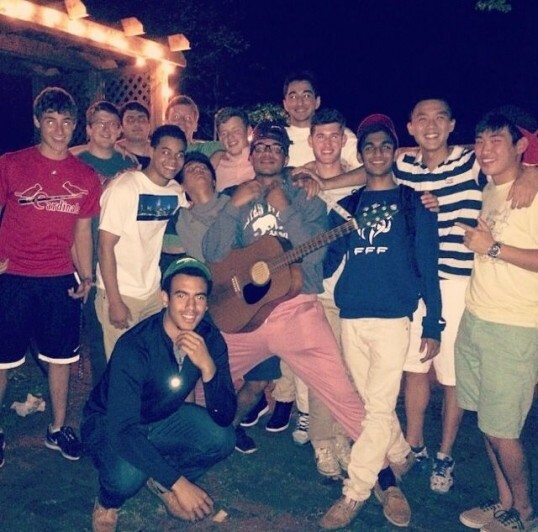 Many of the boys, D’s closest high school friends, were leaving for college that week, and I found myself feeling more trepidation for them than excitement. What are they to think about this world that awaits them? So, yeah. In a way, I’ve made Ferguson “about me.” I realize that loving my friends and their sons, and my daughter’s boyfriend, isn’t remotely the same as walking in their shoes, but it’s what I’ve got and it moves me. All I’m trying to do here is share my truest thoughts and feelings about the situation, in the best way I know how. I’m tired of pretending that things aren’t about me, when it’s utterly human for each of us to connect to the world through our personal stories and our hearts. Let’s hope we don’t forget how to do just that. Thank you for reading and commenting China, and for caring enough to struggle through this issue. Every time I hear 41 Shots from Bruce Springsteen I am floored by the mom’s advice to her son. And quite appreciate Twitter’s ability to bring non-professional video to the forefront. They’re a wonderful group of kids. I’m grateful that my own children can grow up in a school district that’s not only diverse, but also quite socially integrated. It isn’t perfect, of course, but they are learning so much about people and the world through the good things they experience there as well as the less-than-perfect things. Thanks for sharing that interview! We all need to make efforts in our lives—in spite of our still-segregated communities and churches—to make personal connections that cause us to care deeply. Thanks, Kristen. It really is about all of us. 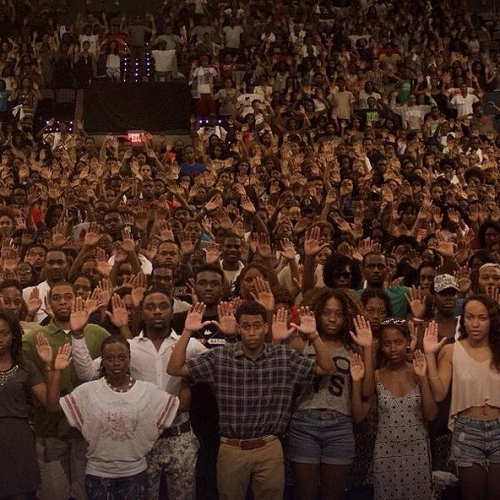 We are Ferguson, in many ways. It sometimes takes events like those of the last few weeks for us to get a renewed grip on what is reality for so many people. A lot of wisdom here, friend. I believe we need to wade into these waters, aware we won’t always get it right, being willing to listen and learn, and doing what we can to eradicate racism.